Hi! I drew this on April 15 and colored it in a few days after. 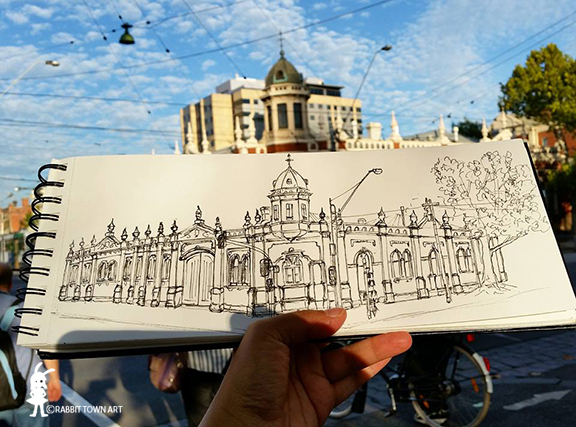 I have been enjoying the Urban Sketching but also being creative for my tumblr site. I've also been working on my Red Bubble selling site, which I haven't in a long time. I wish I actually kept up with it and kept on creating and posting on this site. I feel like am back to square one on trying to build relationships on it and building the fan base. Oh well. I tried to start a new Red Bubble site using my Rabbit Town Art one but I already have followers on my old one (though who knows who is still around). Anyway, been working away on that and when am happy...I will promote!